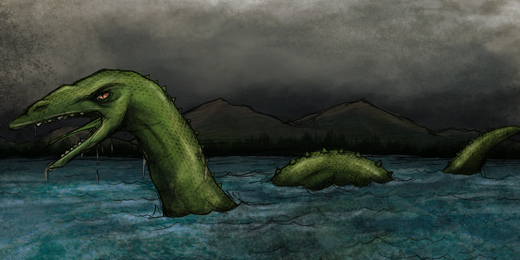 Stories of the Bear Lake Monster originated near Bear Lake, on the Utah-Idaho border. The legend of the Bear Lake Monster originally grew from articles written in the 19th century by Joseph C. Rich, a Mormon colonizer in the Utah/Idaho border area of Bear Lake, purporting to report second-hand accounts of sightings of the creature. In recent years, the monster is considered to be a tourist attraction—or is it? The last reported sighting of the monster was in 2004. The Bear Lake monster also appears in Animal Planet’s “Lost Tapes,” drama series, in which it is depicted as similar to a crocodile or a mosasaur. This page is a place to read more about the beauty of the deep blue Bear Lake and its infamous Bear Lake Monster. If you happen to see it, please let us know! Also visit our sister page at BearLakeVacation.com.